I’m a contradictory girl, and everyday I wake up and try to understand myself but never make it. You may think that why am I suddenly starting my blog post with this non-related thing? Well, I’m now in vacation, actually a before-finals vacation, so my daily basis is all about sleeping, cooking, eating and revising (the last thing should have been written super tiny because nothing came in my head since my classes and lectures ended 😦 ). I still remember that during school year, I always desperately wait for the weekend, or vacation, have in my mind thousands of perfect ideas for my lazy days, how I can lay on bed all day and get fat (whoops). But now when I’m actually having my vacation, I become pretty… bored. Everyday is the same and I start feeling a little bit mad and dumb at the same time. Sitting on bed, sticking my nose on the laptop screen all day, errr, is a no-no for me, maybe I enjoy staying at home, but just not everyday. I even stressed out in my little room and became exhausted, and what’s my decision? Sometimes I go out for no reason, to the supermarket, to the mall, to the park, just to breathe the fresh air and feel like I’m still alive and having something to do. At least walking is healthy. 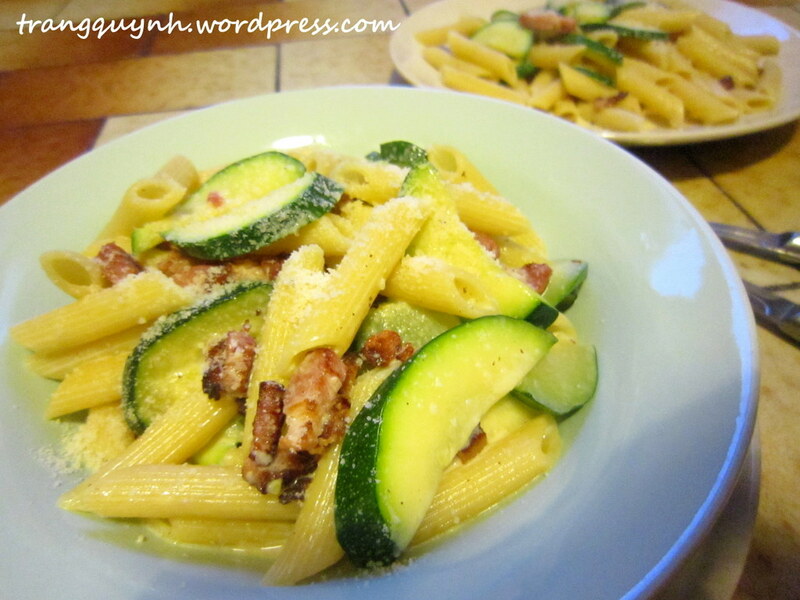 Apart from my “vacation crisis”, today’s post is all about this beautiful and creamy Courgette Carbonara. Making any kind of carbonara always brings me joy, idk but everytime I see the sauce slightly cooked by the heat of the pasta, it’s kinda…magic for me (that childish side of me though). In comparison with the usual carbonara, this version is more springy and healthy by adding some courgette slices, since it’s spring time so I guess vegetables are a must for our everyday meals, it’s always good to eat more veggies, right? I want to keep this post a little longer but I found out that I accidentally deleted almost photos for this dish, so it’s really guilty to make you all read through this super long post without any food photo.